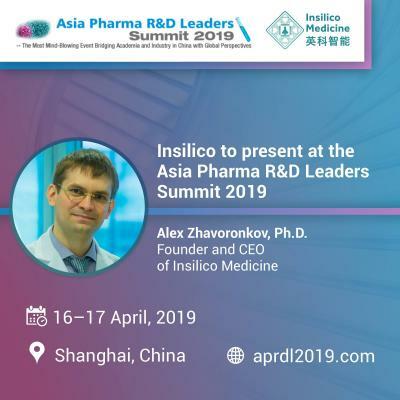 Wednesday, March 6, 2019 – Insilico Medicine, a Rockville-based company developing the end-to-end drug discovery pipeline utilizing the next generation artificial intelligence, will present its latest results in modern and next-generation AI for Drug Discovery and productive longevity at AI Innovation in Pharma – Asia Pharma R&D Leaders Summit 2019 in Shanghai, April 16-17. “We are happy to present our latest research at the Asia Pharma R&D Leaders Summit 2019, which gathers the leading longevity leaders. The topic of AI for Aging research and Productive longevity is rapidly gaining popularity, and we are happy to be at the leading edge of this research and one of the innovation drivers in the area”, says Alex Zhavoronkov, Ph.D., Founder, and CEO of Insilico Medicine, Inc.
“AAIH looks forward to being part of the Asia Pharma R&D Leaders Summit and is excited that Dr. Zhavoronkov, whose company is one of the founding members of our organization, will be a principal presenter on AI innovation at this global gathering of pharma industry executives and scientific leaders,” said AAIH President Annastasiah Mudiwa Mhaka, PhD., president of the Alliance for Artificial Intelligence in Healthcare (AAIH). Mhaka will join Zhavoronkov as a speaker in the AI Innovation in Pharma session to talk about trends and issues in the application of AI to healthcare and introduce AAIH’s global advocacy efforts on behalf of this fast growing segment of the healthcare industry.